Summers in Edmonton are phenomenal. I know I’m constantly trying to soak up the sun and spend as much time outdoors to truly take advantage of our short summer months. I’m always looking for ways to include my dogs in that outdoor fun too – and that includes seeking out dog-friendly patios and markets. 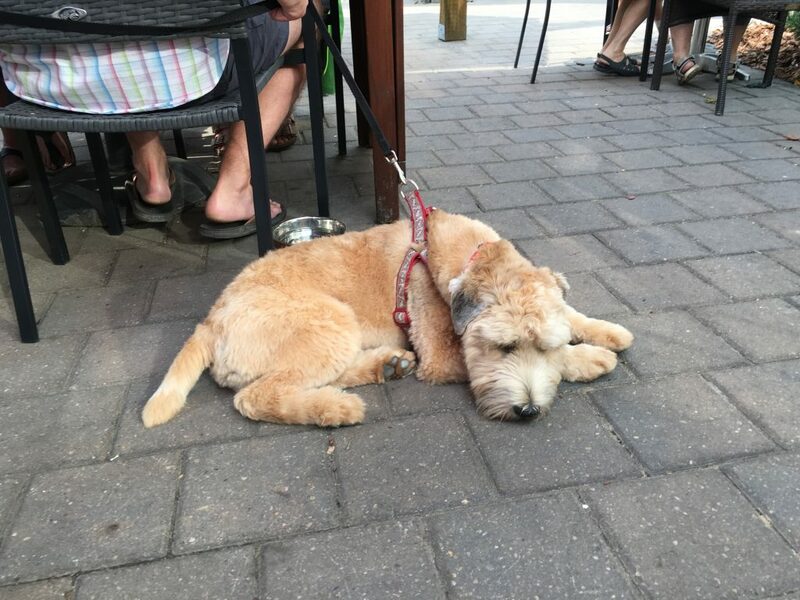 My friend Chithra recently asked me if I knew of any patios that would be dog-friendly and off the top of my head I could name a few, but thought I should also dig a bit deeper and put together a blog post for all Edmonton fur-parents looking to include their pooch in their summer adventures. Almost all of the patios I’ve found (called and asked) that are “dog-friendly”, have the stipulation that you need to tie your dog on the other end of the fence/rail/post. Most patios that aren’t enclosed allow dogs right up to the table because it’s just part of the sidewalk, which is great. There were more patios that allowed dogs right into enclosed patios, but they’ve since changed this citing provincial regulations. Some patios provide dog water bowls for your pup but maybe not the best space for your pup. It varies quite a bit. 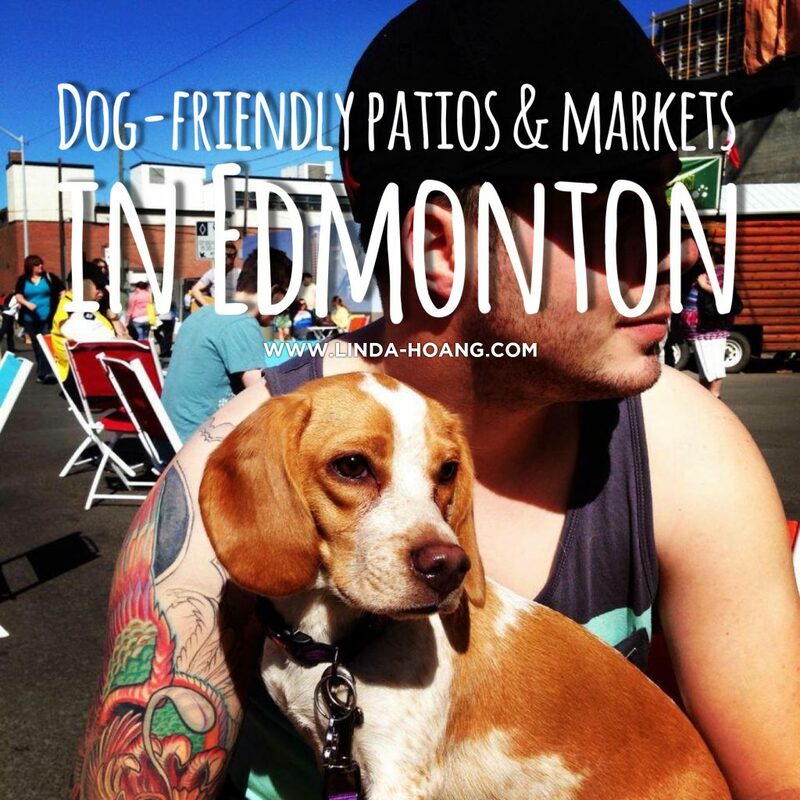 Here’s my list of dog-friendly patios and markets in our city – of course, these could all be WAY more dog-friendly, but that’s really up to the restaurants/patio owners to ensure, so for now – I’ll take what I can get and if this is what we can get (dog friendly-ish) in Edmonton, I’ll take it! I encourage you to call ahead of time just to ensure their rules haven’t changed, or see if you can reserve a table close to a railing so you can ensure you’re still close to your dog! 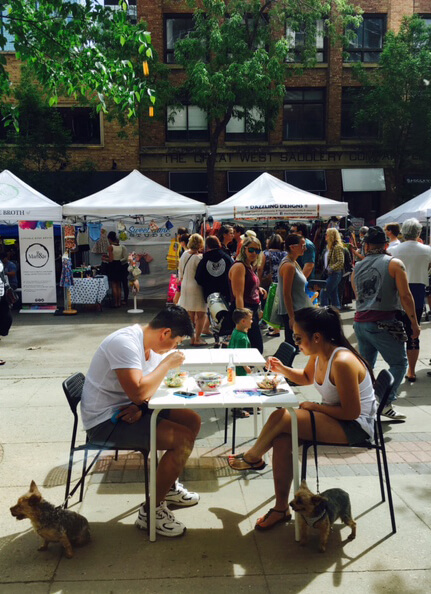 Also check out my other post on how to get more dog-friendly patios approved in Alberta. 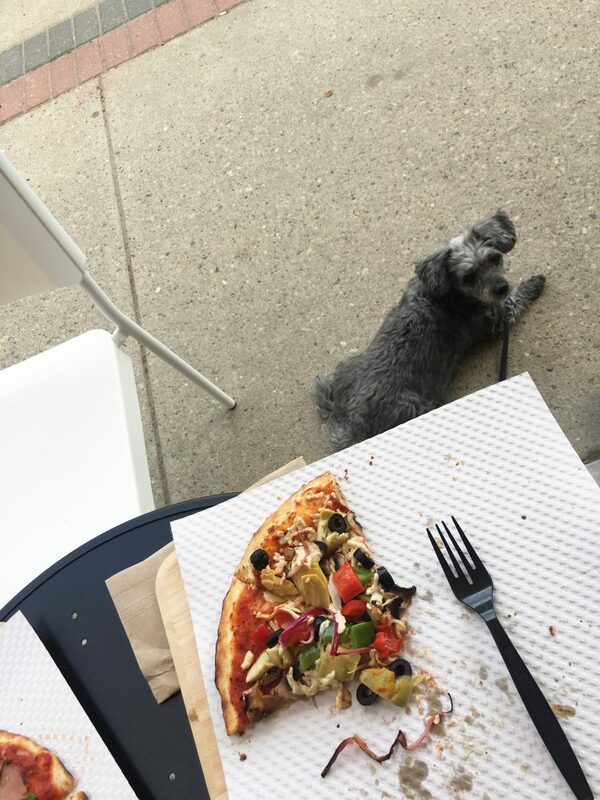 It’s a follow-up to this post, and I hope you use it to encourage restaurant/patio owners to start the simple process to get a dog-friendly permit added on to existing food permits! * Edmonton’s first, provincially approved, enclosed patio that allows dogs in as of May 2018! * dogs can be right at your table! * dog water bowl available for you dog! * submitted by a reader, said they gave her dog water too! I haven’t tried myself because the tall railings concern me so you should call and ask! * dogs can be under or next to your table! Spotted at Cafe Bicyclette: dogs right up at your patio table! * can be right up at your table! Urbano Pizza Pooch! Photo credit: Darryl M.
8422 109 St. or 9855 76 Ave. Dogs outside Ono at City Market! Photo Credit: Tracy Hyatt. * dog-friendly areas available, + dog water! 101 Riel Dr, St Albert. * Lets dogs right into the patio! Thursdays 4 to 8 p.m.
* not a patio or a market, but an actual restaurant for dogs! See the post I made about my dogs’ birthday party here. Remember, most of these patios only allow dogs to be tied on the outer side of the fence/rail/post (so you need to make sure your patio table is close!) Cafe patios (that are not enclosed) are better for having your dog sit right up with you. I’d recommend giving the place a call before you go just to double check that nothing’s changed. So, which dog-friendly patios/markets am I missing? I’m always looking to add to this list so please tweet or email me your suggestions! Enjoy your summer, fur parents!!!! I haven’t been there yet but Farrow Sandwiches on 109 st, just north of Whyte Avenue seems pretty dog friendly. Not so much of a patio but they do have a couple picnic tables outside. Thanks Lesley! Ive been to Farrow many times and totally forgot about the dogs I’ve seen out at the picnic tables! Thanks! I’ve added them to the list. The Pint off Whyte has a wonderful dog friendly patio. Even offers your pups a bowl of water. They have 2 patios. A back and front one. Just the front one allows dogs. I was there just on Sat May 20th with my little guy and there were several other dogs there too! Awesome Sarah, thanks I’ll add it to the list! Wildflower downtown also has a dog friendly patio. They also offer water for your dogs. I was there last Sunday for brunch on the patio with my yorkie! Thanks Bee! I will add it to the list!! I beg to differ. Tying a dog to the outside of patio doesn’t mean it’s dog friendly. Quite the opposite. It’s no different than tying a dog outside while you go inside. Your are just closer to where your dog is tied. Remember to consider water access ! To my way of thinking, dog firendly businesses demonstrate it best when they providing a bowl of fresh water. I phoned ahead to The Needle that is on the list. They told me on the phone it was not a problem, when I got there with my small dog I was told no. Went to the blue chair cafe (also on the list) was told he’s only allowed on the other side of the patio. (Which is pretty much on the sidewalk) Ok I know you mentioned this at the end of your article, but I am not tying up my dog out on a busy sidewalk where people are walking by..just weird to me. If you ask me the only dog friendly thing these people are offering is a bowl of water. Hi Lori! I’m really disappointed to hear The Needle told you one thing and then went back on it. I will remove them from the list. As for a blue Plate, And others that have the rule to tie the dog on the their side of fence – it’s definitely not the preferred dog friendly route but I think it’s better than nothing! Especially if I’m able to get a table right up by that fence/rail. Good luck! Linda, thank-you for this list! I love it! I would also like to add that what makes places dog friendly is being a responsible pet owner. Always picking up after your dog and making sure it’s not disturbing other patrons or other dogs. I love taking our dogs to the Market on 104 but I noticed lately that lots of people just let their dogs rush up on yours or get in their face without asking. This is how problems start. Remember if you are in a public space to be aware of your dogs surroundings always and consider that not all dogs are ‘dog brave’ or ‘dog friendly’ for that matter. I can’t wait to check some of these places out :) Thank-you!